Protect your tour-pak and storage options! 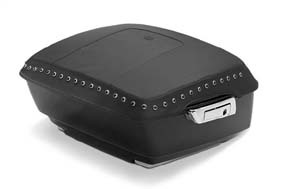 TB-MST: Protect your tour-pak in style with one of our Lid Covers in plain, chrome or black pearl centered studs. Fits either model years '93 - '13 or '14 to current. Black. TB-TB Line: After extensive design testing, a product that allows luggage to be attached to rackless King or Chopped Tour Paks. 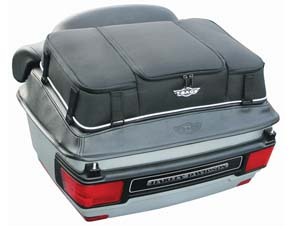 This system allows Harley riders to carry additional cargo and still display a rackless Tour-Pak when they remove their luggage. The system requires no drilling’ it protects the Tour Pak, installs in minutes and can be completely removed to show that custom pain job again after the trip. 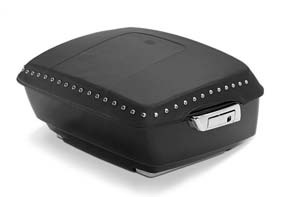 The system centers on a specially designed Tour-pak Bra with tie down points for luggage attachment. You can purchase individual items or a full kit. Components consist of (1) A simulated leather Bra that attaches skin tight to BOTH the King or Chopped Tour Pak lids AND (2) An attachable slim line 1 lid or 3 lid rigid Bra Bag with a reflective rain cover & detachable should carrying strap. The BRA also works with the TB-BC BOOTCASE. Lifetime OEM warranty. Made of 1680D ballistic nylon – YKK zippers and hardware. TC-065: The Tour Trunk Chap adds to your Dresser's looks while protecting your investment. 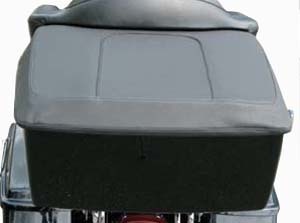 This stitched cover is form-fitted to your bike's Tour Pak, with a soft backside that takes care of your paint. 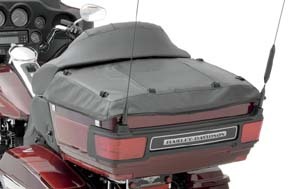 It's a great looking way to protect your bike from sun damage, weather, dirt, road debris and loading mishaps. 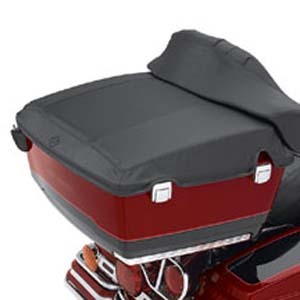 In addition to all this protection, the rugged leather-grain vinyl goes with the look of any bike. The Tour Trunk Chap easily attaches with hook-and-loop tape, hidden from view, safely seperated from the bike's finish, and comes off in seconds. 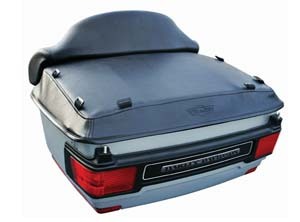 As an added feature, there are D-ring attachments to accommodate Saddlemen's TR3300DE Deluxe Rack Back, providing the option of extra touring luggage without the need for a chrome trunk rack. 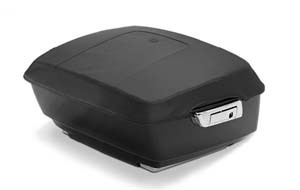 TH-TBKC: Protect your Chopped or King Tour-Pak® Luggage from scratches and road debris. The Tour-Pak® Lid Bra is made with non-abrasive fleece-backed vinyl material and features an embroidered Bar & Shield logo. Easy-to-install with Velcro®-backed tabs. 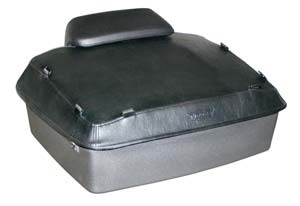 Fits models equipped with Razor-Pak, Chopped Tour-Pak® and King Tour-Pak® Luggage. 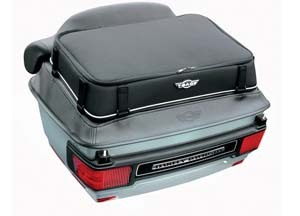 Does not fit with Tour-Pak® Lid Racks, Tour-Pak® Lid Spoilers or Tour-Pak® Interior Light Kits.